Are you feeling lucky, Moonchild? Since you’ve suffered more than your fair share of difficulties lately, you may be feeling more unlucky than lucky, but events of the next few hours or days should change all that. The universe is working in your favor, and you must also have a guardian angel or two summoning up bright blessings for you, because your world is about to get so much better! Think in terms of greater prosperity, creative fulfillment, and even a bit of fame, perhaps. It may seem too good to be true – but it’s true! Well, this plays on my previous horoscope. I really would like to get into 3D printing so I can make things for around the house, replace broken parts all over the house and maybe on my old 1988 Jeep, but most of all, making things for my garden experiments. I have some ideas how I could improve the functioning of my vegetable garden to increase the productivity of the plants, giving me better harvests and more healthy, more naturally grown food to nourish my body. And I suppose, if those gadgets could be mass produced, maybe I could make a living from the income? You are teetering on the edge of a new and exciting idea. You are hesitant to take the plunge and to make an attempt at turning the idea into a real opportunity. You fear you could make a mistake, or maybe you’re just afraid that no one will take you seriously or will think you’re thinking is faulty or even flaky. Then again, Moonchild, if you’re really onto something – and it’s likely that you are – this idea could transform some area of your life in a wonderful way. Think of terms of the possibilities this idea could ultimately bring – they include prosperity and fulfillment through a creative pursuit. It’s certainly worth looking into. Wow, okay, in previous horoscopes I was told some “wonderful, happy future” is imminent, and now today’s horoscope. Too wild. Let’s look at the above though; the statement that I’m really into something… well, I really am into gardening, of the food variety kind. I love to nurture food plants in my backyard garden. I would love to have more time to dedicate to it, so I could grow more things, and hence eat more from my garden. Then the second thing that struck me is the “creative pursuit” statement. For the last 15 years or so, I have worked in the computer support and centralized IT world, and as part of my knowledge I have learned about 3D printing using machines like MakerBot and RepRap. 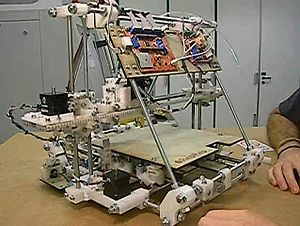 I have been imagining printing 3D contraption or inventions that will help me further my gardening efforts. I am not ready to reveal my ideas for the 3D printed parts, yet, but maybe this is my creative part I need to discover? I think I will use this blog to just flush my mind, and hopefully, over time, I will contribute more usefule information… or maybe I will start a new blog… I really would like to discuss issues related to my (what I call) personal and family economy (also called a budget). This would include what I plan on doing to help our stretched-to-the-limit personal economy by planting a garden and other projects that will reduce the food budget and other things I can do to reduce our expenditures.